*** C-USA games appear in no set order. Actual order, date, and time to be announced sometime during the winter. The Owls will have TWO bye weeks in 2019; first time ever. Dates added up to, if course this is subject to change when the TV schedules are finalized. The schedule just released for 2019 looks real good for the Owls. As of now no mid-week games and other than the first two games (Ohio St. and UCF) looks very winnable! 1) NO other CUSA team has a bye (2 bye weeks for every team this year) before they play us. 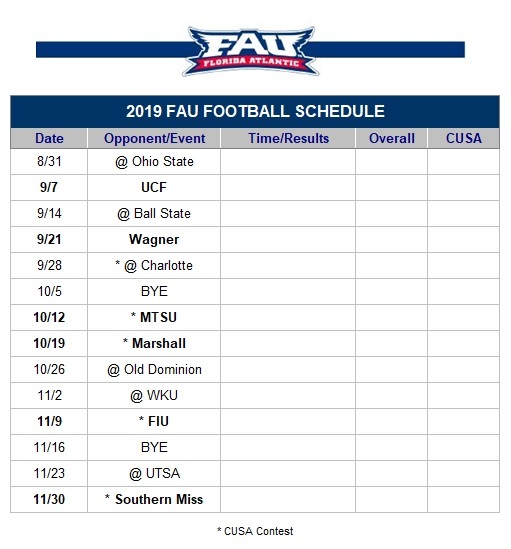 2) FAU has byes before two (2) CUSA games (MTSU and UTSA). 3) ZERO FAU CUSA foes will have a bye week before playing us! 6 other CUSA teams have this benefit as well. 3 teams have 1 opponent with a bye before a CUSA game. 4 teams have ZERO CUSA opponents with byes before a CUSA game (UNCC, MTSU, ODU, WKU). All 4 are Division foes! 4) ALL CUSA opponents will in addition be coming of extended consecutive games played before they play us. We will be the 6th consecutive game for FIU, ODU and WKU (ALL division foes as well!!!). We will the the 5th consecutive game for UNCC (Division foe!). We will be the 4th consecutive game for Marshall, S. Miss. and UTSA. We will be the 3rd consecutive game for MTSU. 5) UNCC plays CLEMSON the week before us. MTSU plays Michigan, Duke, Iowa and Marshall in their 5 games before they play us. ODU plays at Marshall and at UAB before they play us. MTSU has by far the toughest schedule next year with 3 Power 5 OOC games (Michigan, Duke and Iowa) and 3 CUSA foes with byes before playing them. Next toughest would be Rice, also with 3 Power 5 games (Wake Forest, Texas and Baylor) plus Army with 2 CUSA opponets also coming off of byes. ODU, S. Miss, UTSA nad WKU allplay 2 Power 5 foes. Only Marshall plays NO Power 5 games but they have tough Group of 5 games vs. Boise St., Ohio and Cincinnati. But as we all know, nothing matters but preparing and then winning on the field. Gotta play and Coach better this year Owls, it i there for ya to bounce back and take it. NOW DO IT! Also just in, the UCF game will air as well, and kick-off at 7:00 PM at Schnellenberger Field. Wow, they kept UCF game on a Saturday! This will be the biggest home game in history. Tailgate will be set up at noon!!! The game vs OSU will be ESPN or big 10 network. UCF game will be on one of the ESPN networks. If had to bet it will be ESPN2 or U based on the time slot. Also just in, the UCF game will kick-off at 7:00 PM at Schnellenberger Field. Cool – I'm going to try and come down (from NY) for that one.